Newcomer Family Obituaries - Christine Elizabeth Runyon 1967 - 2018 - Newcomer Cremations, Funerals & Receptions. Christine Runyon, age 51, passed away unexpectedly at home Wednesday, September 5, 2018. She was born on May 26, 1967 in Columbus, OH. Chris enjoyed spending time with her grandchildren, swimming and visiting the ocean. She was a very loving person with lots of friends and loved ones who will miss her dearly. Surviving family includes husband, Terry Runyon; children, Terra Runyon, Christina (Edward) Gould, Todd (Janielle) Runyon, Chad (Jessica) Runyon and Erin (Lamont) Hicks; grandchildren, Brantley, Keegan, Braxton, Lauren, Malachi, Landon and soon to be expected, Bryson and Brayden; father, Foster Beveridge Jr.; also survived by numerous brothers, sisters, nieces, nephews, aunts, uncles and friends. Preceded in death by mother, Jeannine Beveridge (Were). Funeral service will be held Friday, September 14, 2018 at 6:00 p.m. at Newcomer Grove City, 3393 Broadway, where visitation will begin at 2:00 p.m.
Add your memories to the guest book of Christine Runyon. You are on my mind a lot today Aunt Christine and we all miss you so much. You were always so full of life, energy, and love. I remember you would always go around the office singing and I would always laugh because I could hear your loud voice all the way from the other side of the office. From working with you the last 4 years, I learned so much from you. I will always admire your kind heart, generosity, and strength. I hope you are having a blast up there in Heaven. My sister was so much more than a sister. She was my co-worker, boss, best friend, and my second mother. Ever since our mother passed in 1997 my big sis has always been there for me, and i for her. I could write a book of the memories that we have shared over the past 7 years since we have been working side by side together. The most recent and my personal favorite were the starbucks jokes. Every week she would tell me that she not going to drink that crap. Every week I would catch her coming around the corner with that cup in her hand and I would say "I thought you quit this week" she would say next week for sure. The last week i saw her coming around the corner with a starbucks a i simply said "next week" ? as she tried to hide that huge starbucks cup behind her back she replied "what are you talking about". Christine and I were good friends throughout our teens and twenties. We had a lot of fun and mischief. Played a lot of euchre two handed and up. We enjoyed playing cards for hours. Walking around Ohio State Campus. She is truly missed. Godspeed my friend. Prayers and condolences to all who knew her. Please accept my deepest heartfelt sympathies and condolences during this difficult time. Christine was a wonderful friend and co-worker and will be deeply missed. May wonderful memories of her bring you comfort during difficult times. You were greatly loved and cherished by your family and friends. May your soul rest in peace with the Angels. I first met Christine in 2002 when we worked together at UCB. Christine, myself and eight other collectors were all new to the company having been hired on to staff a brand new department. We all had varying degrees of experience in collections. Christine was a lot younger than I, but she seemed older and wiser for her age. Her negotiating skills were very impressive. She was positive, pleasant and self assured in dealing with taxpayers. She could work out arrangements with even the most difficult people with ease and in a friendly manner. I learned a lot from her. I admired her, wishing I could be as good! She was so smart and accomplished. She was always among the top collectors month after month. Even than she never let this fact get to her head. She got along well with everyone in her easy going way. There was no doubt in my mind with her leadership skills she would be a success in the business world. It did not surprise me that in 2005 she moved on to pursue greater challenges, taking on a management position with another firm. Over the years we have been in contact now and then. My wife, Cindi and I attended a Super Bowl party at her home some years back. Christine and Terry treated us like family. In April, last year, Cindi and I and Christine met for lunch at the old Max and Erma's in German Village. It was fun remembering old times and catching up on what was going on in our lives. She was such a proud grandmother. Just this June she contacted me, inviting Cindi and I to a barbeque at her home. Unfortunately, something came up and it had to be postponed but with the promise that we would see each other soon. We were looking forward to that barbeque. She was a wonderful friend, with a great smile, always joking around. She will be greatly missed! Christine we haven't seen each other, other than family get togethers and holidays but you always had a warmth and sweet presence to you that brought the whole bunch together:) I know you are at peace now but God knows we all wished you were still here at least a little longer. Love ya Christine, you're gone but never forgotten. Until we see you again. Christine, R.I.P my dear friend till we meet again. To my sister who I love so very much. You will be greatly missed, but your love and spirit will live forever in my heart. 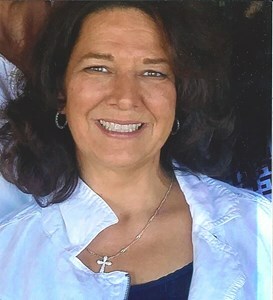 Chris was a very loving and caring person who extended her love to all who encountered her . She will be greatly missed. May the Lord provide the peace and comfort to console her family , loved one's, and friends during this trying time. Amen and God bless. Our deepest condolence to the family. And for dear Christine , I will miss you very much my friend . I will treasure the few times and few moments I shared with you , not to mention your fave White Russian drink , the jokes, the laughter and hugs . All these will be lasting memories within me. And may you find the eternal peace and happiness in heaven . My thoughts and prayers are with Terry, Erin, Todd, Chad and the family. May God fill your thoughts with wonderful memories. GOD HAD PLACED A WOUNDERFUL ANGEL IN OUR LIVES SHE WILL TRUELY BE MISSED WE SEND ALL OUR LOVE AND PRAYERS.